It’s full of pumpkins! The wet weather has prompted the pumpkins to become pre-maturely soft. So much rain! We try to shove bricks or boards under the pumpkins to prevent slugs. A couple of bugs had bore into the bottoms of the pumpkins. The marrows have not quite finished hardening off. 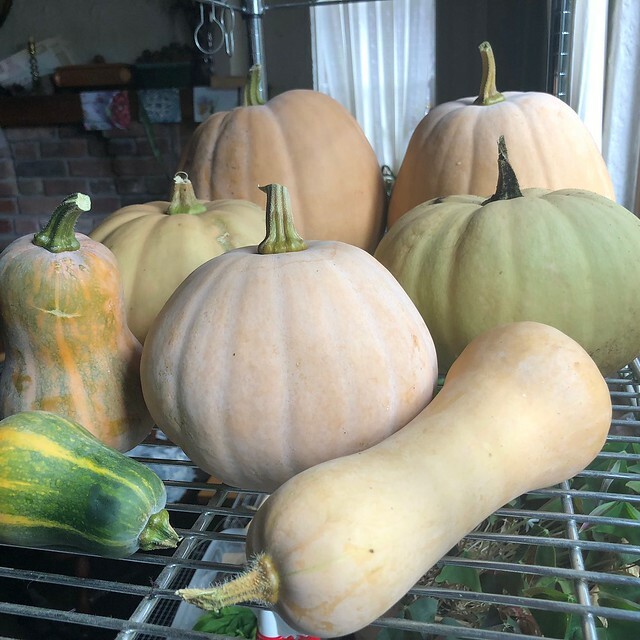 They need two weeks to harden off, both pumpkins and winter squash in order to develop a thick skin for storage. So after I got back from SVFF, I started cutting pumpkins and scooping seeds. The seeds are drying for next year. The cooked pumpkin is getting frozen for now. I still have two more to bake that are discoloring. I tallied the produce weights. Pumpkins harvested so far, account for 46 pounds of food. There are still more in the garden. Another female flower was pollinated today. We have another mini watermelon too. The wet weather has made all the tomatoes split. Then they get buggy. The ground hog is gnawing on tomatoes as well. So the tomatoes don’t look especially well. Sweet potatoes won’t be harvested until first frost. Though I’m trying to harvest all the basil before it gets cold. I also picked dried beans today. We have surpassed last year’s total. We are at 221 pounds of food and we are not done yet. Last year’s total was around 210 lbs. Seed saving is also underway. Once it turns cold, I will make more tomato sauce, pumpkin bread, pumpkin soup, and look for new recipes. The dehydrator has been such a blessing. With such high humidity, we’d never get the herbs to dry! Still to do, harvest chard for the freezer and roast some pumpkin seeds and pull carrots.